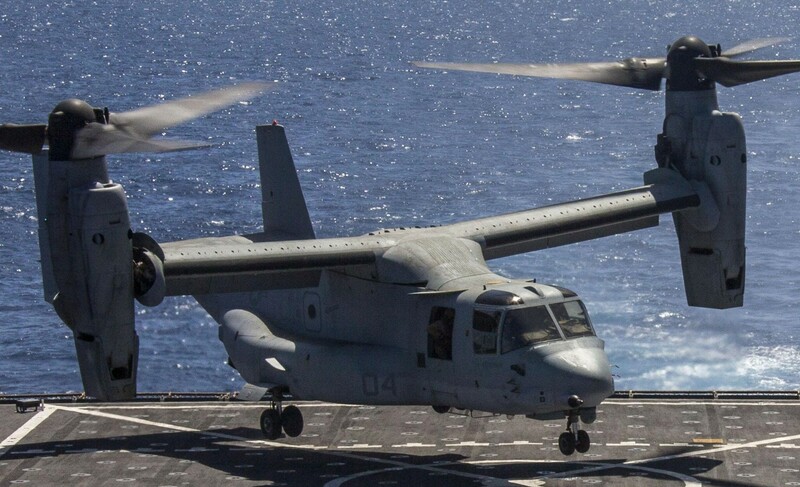 As part of the 2d Marine Aircraft Wing (2d MAW) plan to create “mirror image” air groups, Marine Medium Helicopter Squadron 266 was activated on 26 April 1983 at Marine Corps Air Station (MCAS) New River, North Carolina. In its first year, the squadron established a foundation that would make it the cold weather assault support experts for 2d MAW. 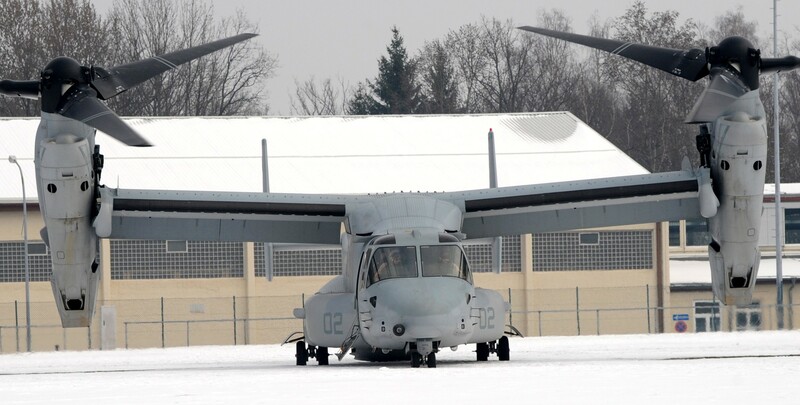 Over the course of the next six years, the squadron participated in fourteen exercises from the High Sierras of the Mountain Warfare Training Center (MWTC) in Bridgeport, California to the arctic climes of northern Norway in exercises Cold Winter, Teamwork, and Anchor Express. During the summer of 1989, the focus shifted, and HMM-266 was tasked with participating in Exercise Solid Shield ’89, UNITAS ’89, training at NAS Jacksonville, Florida, and Combined Arms Exercises (CAX) at Marine Corps Air Ground Combat Center (MCAGCC) 29 Palms, California. Throughout these exercises, the squadron added desert and jungle training to its arctic specialty. From January to June 1990, operations included training at MWTC, back-to-back CAXs, Weapons and Tactics Instructors (WTI) Course support at MCAS Yuma, Arizona, and exercises in Honduras. In April, the squadron received the Fleet Marine Force (FMF) Atlantic Annual Aviation Safety Award as well as the Chief of Naval Operations (CNO) Aviation Safety Award for calendar year 1989. During May and June, HMM- 266 deployed to the Caribbean in support of Exercise Trade Winds ’90. Following the invasion of Kuwait in August 1990, HMM-266 initially provided aircraft and personnel to other MAG-26 squadrons as they prepared for deployment. 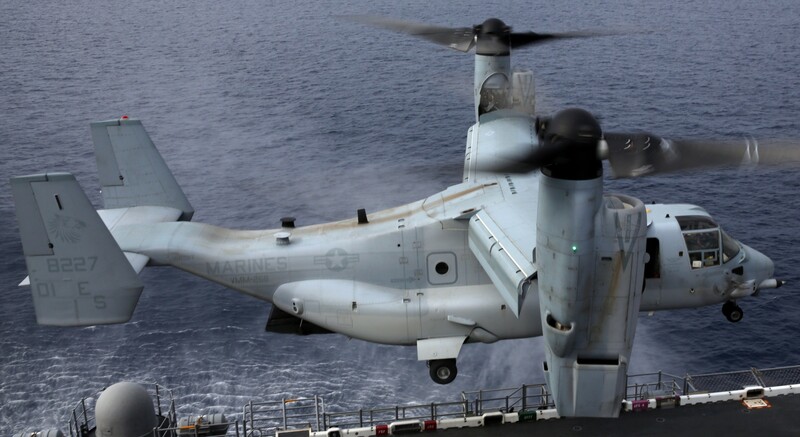 Immediately, the squadron commenced a rebuilding program and in October, HMM-266 was designated an Aviation Combat Element (ACE) for Landing Force Sixth Fleet (LF6F) 2-91 with a December Change of Operational Command (CHOP) to the 22nd Marine Expeditionary Unit (MEU). During the first week of December, the squadron’s assignment was realigned for immediate deployment in support of Operation Desert Shield. On 31 December 1990, HMM-266 became the first CH-46E squadron from II Marine Expeditionary Force (MEF) to deploy to Southwest Asia (SWA). On 4 January 1991, the squadron arrived in SWA. Initially based in Jubail, Saudi Arabia, the squadron provided assault support in the form of Tactical Recovery of Aircraft and Personnel (TRAP), troop movement, casualty evacuation (CASEVAC), and re-supply missions. The squadron moved to Combat Outpost Lonesome Dove with the rest of MAG-26 for Operation Desert Storm and conducted combat support from this location until offensive operations ceased on 28 February 1991. In May, the Fighting Griffins were the last MAG-26 squadron to return to MCAS New River. 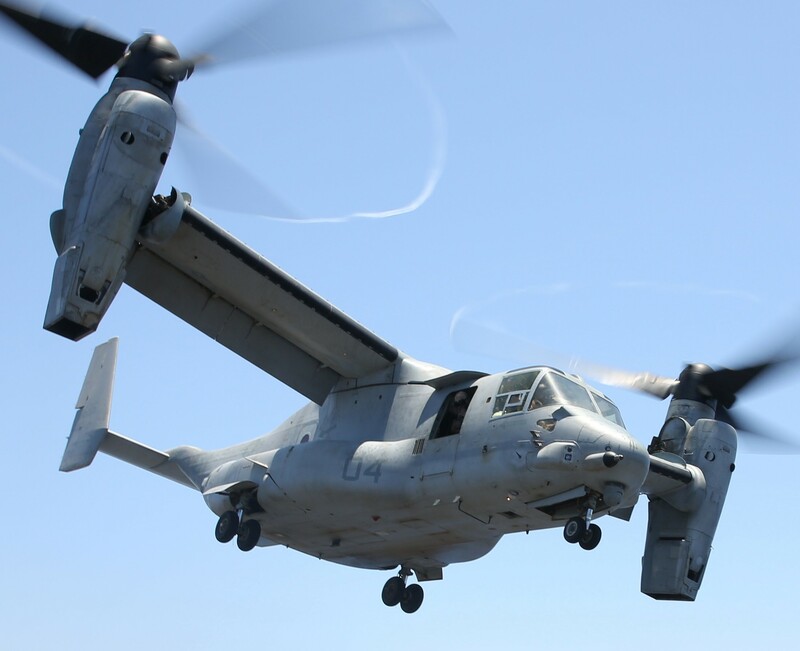 In August of 1991, the Fighting Griffins went composite as the ACE for the 24th MEU. 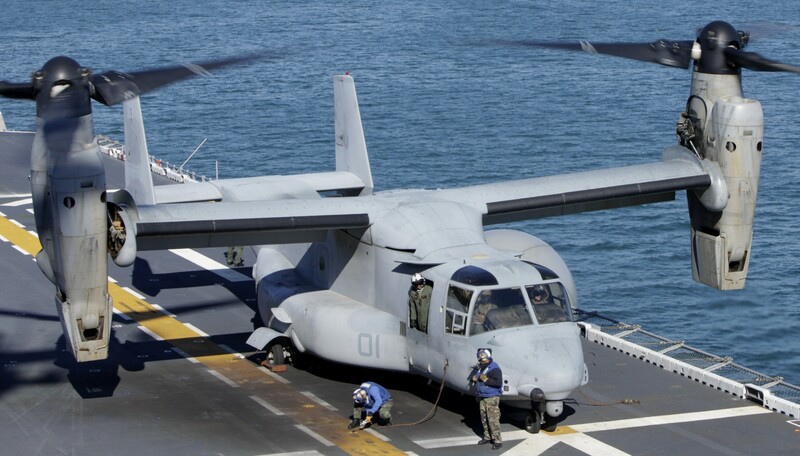 In December 1991, HMM-266 (Rein) deployed on the USS Inchon for LF6F 1-92. 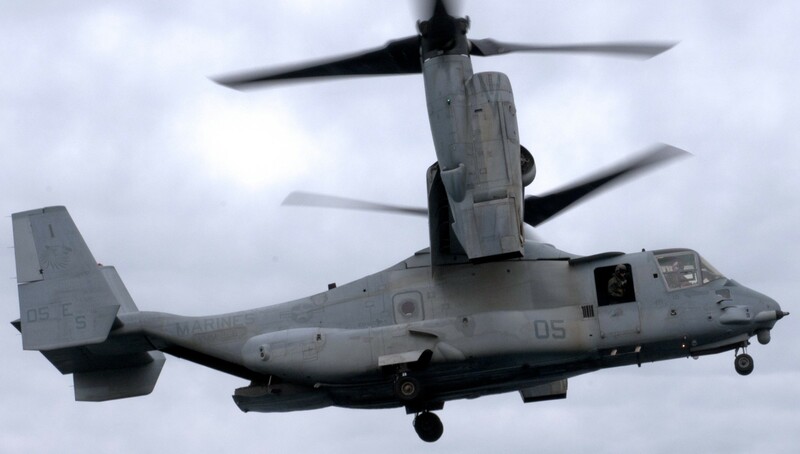 In 1992, while off the coast off Italy, the CH-53Es of HMM-266 (Rein) made worldwide news. They provided heavy lift support when Mount Etna erupted and lava flow threatened to wipe out the town of Zafferana, Sicily. In 1993, the squadron participated in CAX and WTI. 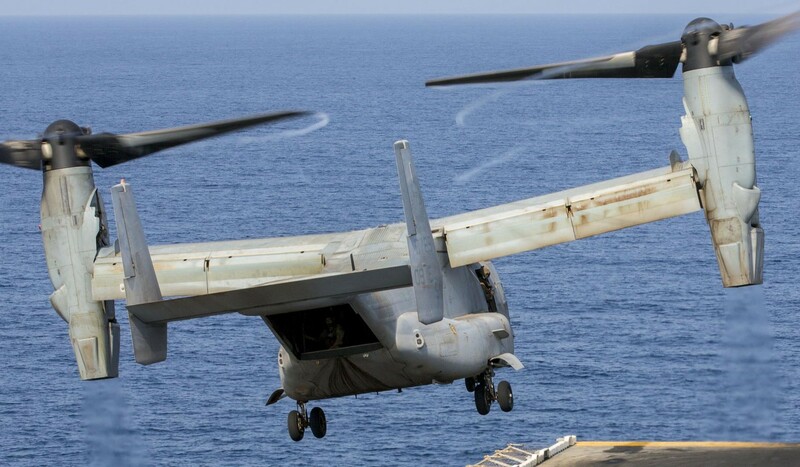 The Fighting Griffins then had a July CHOP to the 24th MEU for another LF6F deployment. In April, the squadron received the FMF Atlantic Annual Aviation Safety Award as well as the CNO Aviation Safety Award for calendar year 1992. In January 1994, HMM-266 (Rein) embarked aboard the USS Inchon for LF6F 1-94 (Jan 94 – 15 Aug 95). In February and March, the squadron supported Operations Continue Hope and Quick Draw in Somalia. After successfully completing these operations, the Fighting Griffins proceeded to the Adriatic Sea in support of Operations Provide Promise and Deny Flight. 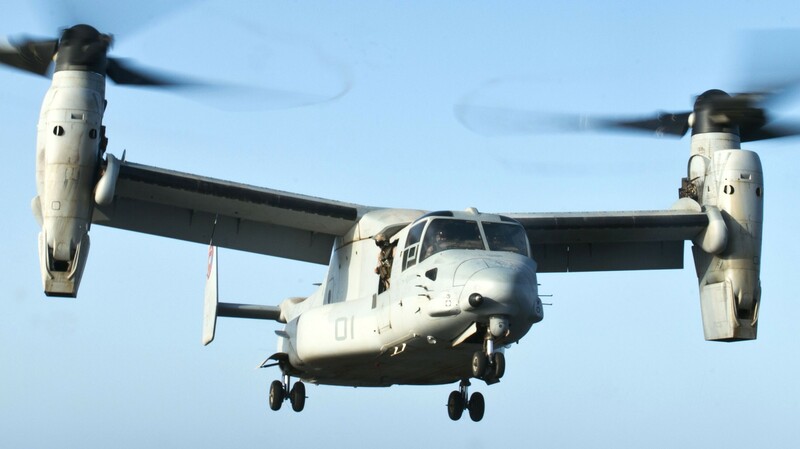 HMM-266 (Rein) returned to MCAS New River on 23 June, and 10 days later was recalled to deploy to the Caribbean in support of Operation Support Democracy in Haiti. Following that, the squadron arrived back at MCAS New River on 15 August. In January 1995, the squadron deployed to MCAGCC to participate in CAX 3/4-95, at which it successfully supported around-the- clock missions and completed an aggressive training schedule. 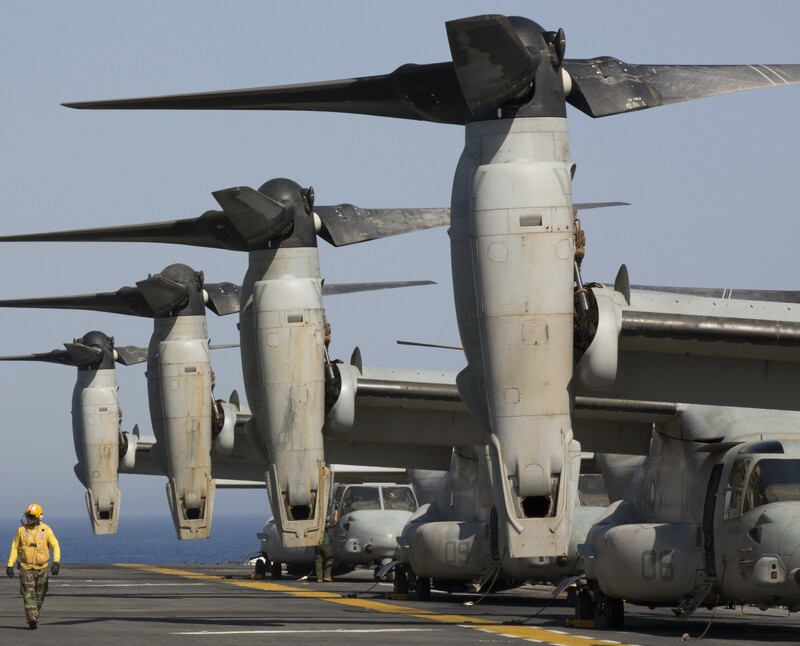 Upon completion of CAX the squadron sent six of its CH-46Es to support the spring WTI class. In April the squadron received the CNO Aviation Safety Award for calendar year 1994. In October the squadron conducted a six aircraft deployment to Camp Dawson, West Virginia in order to conduct mountain area training in anticipation of an upcoming deployment. 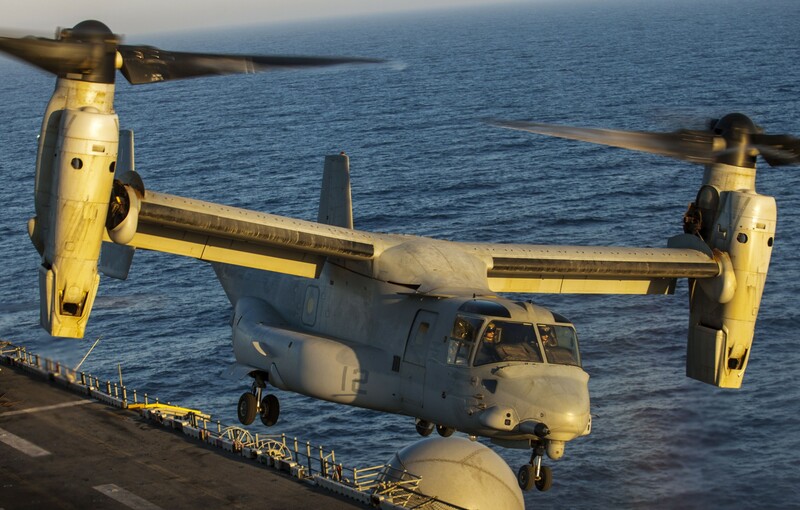 By the end of the year, the Fighting Griffins had once again received detachments from other 2d MAW units and had again executed a CHOP to the 24th MEU as the ACE. 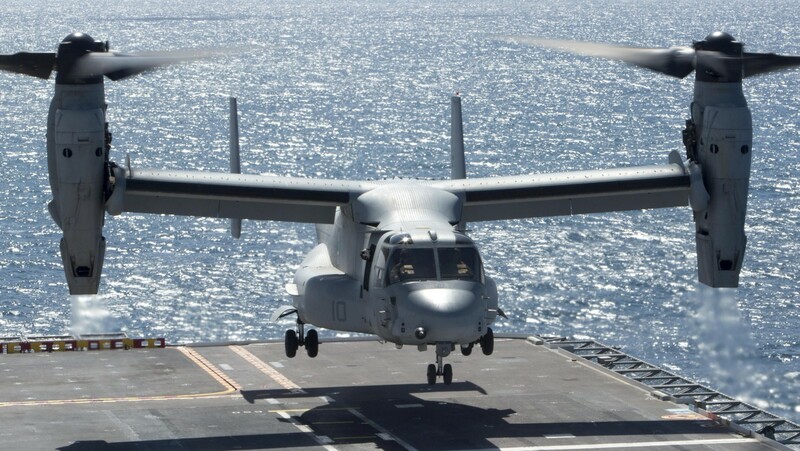 Following the pre-deployment workup and the MEU(SOC) certification, HMM-266 (Rein) deployed for LF6F 2-96 (29 Jun 96 – 19 Dec 96) in June. 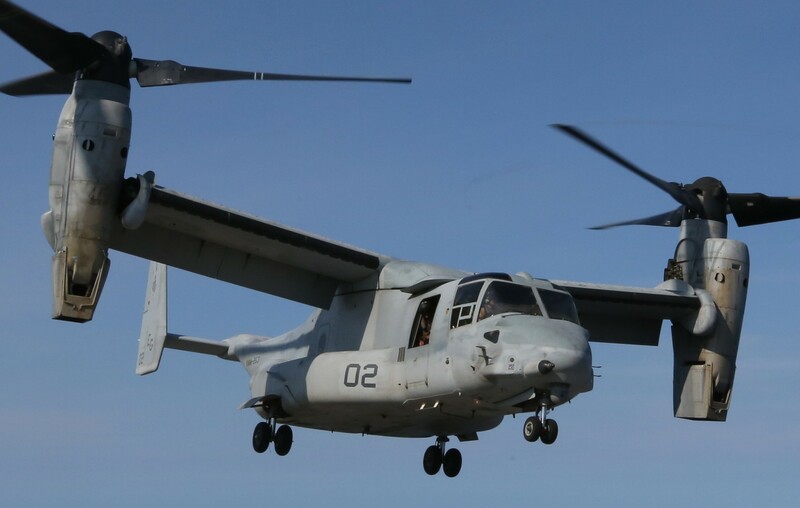 Throughout most of July and into August, three CH-46Es from the ACE were detached and conducted an exercise in Constanta, Romania and a port visit in Odessa, Ukraine. Immediately after rejoining the detachment, the ACE participated in Exercise Rescue Eagle in Albania. 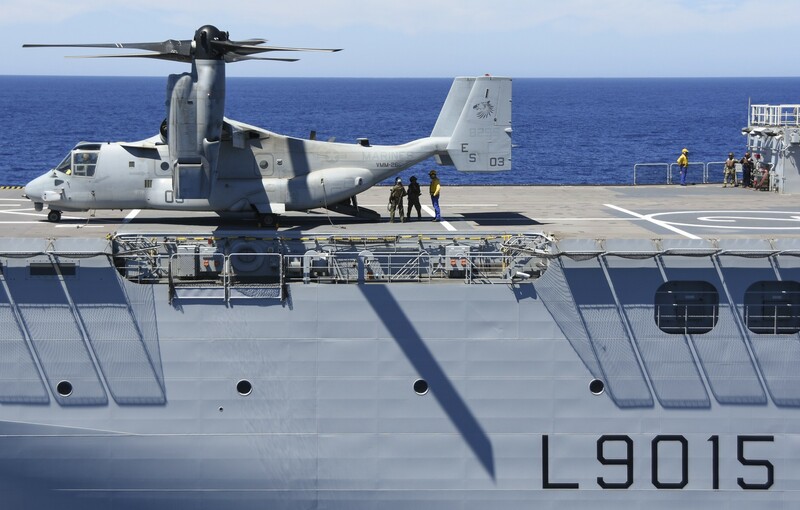 While the Amphibious Ready Group (ARG) conducted a maintenance standdown, the ACE debarked and trained in Sicily for the first half of September. Following that, the squadron maintained Tactical Recovery of Aircraft and Personnel (TRAP) standby off of Bosnia in October, participated in Exercise Dynamic Mix in Turkey, and then conducted training in Israel in November. The Fighting Griffins returned to MCAS New River on 19 December 1996. In February 1998, the squadron again conducted a deployment for training to Camp Dawson, West Virginia. 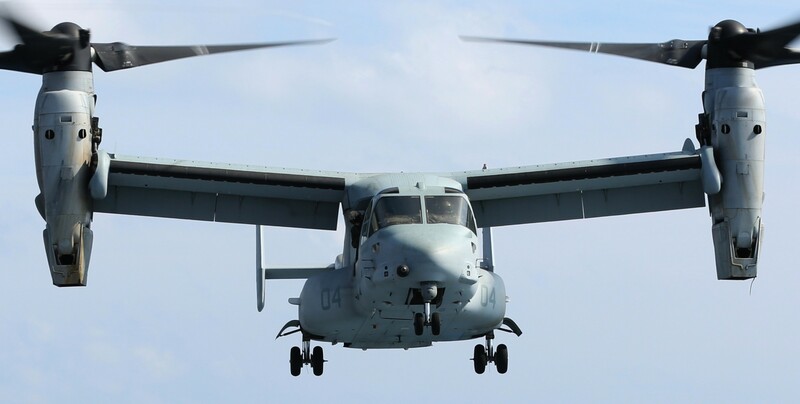 HMM-266 began May as a reinforced helicopter squadron due to a one month early composite date for the next upcoming LF6F deployment. The early formation of the ACE supported the Maritime Commanders Operational Training (MARCOT) and Exercise Unified Spirit in Canada in June. 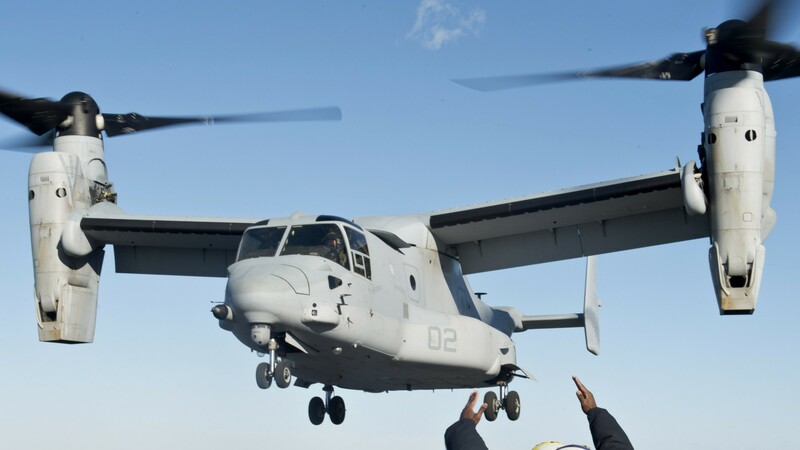 The squadron’s official CHOP to the 24th MEU took place on 11 May. The squadron deployed for LF6F 1-99 (14 Nov 98 – 11 May 99) in November 1998 and immediately detached three CH-46Es and its two UH-1Ns to conduct contingency operations off the coast of Albania concurrent with Operation Silver Knight. Meanwhile, the ACE participated in exercises in Israel in December 1998 by flying to Nevatim Israeli Air Force Base. HMM-266 made history during this exercise by being the first American unit to conduct bilateral training with the Israeli Air Force. While the ARG put into ports for the holiday period, the ACE debarked to Rota, Spain in order to continue to train. From the end of February into mid-March the squadron participated in Exercise Alexander the Great in Greece. In March 1999, the Fighting Griffins were designated the TRAP stand-by force in support of Operation Allied Force and Joint Task Force (JTF) Noble Anvil strike missions into Serbia. Upon arriving on station, the Combined Air Operations Center (CAOC) assigned the ACE AV -8Bs six excess combat strike sorties per day. The AV-8Bs flew their first combat sortie on 14 April with strike missions into Kosovo. 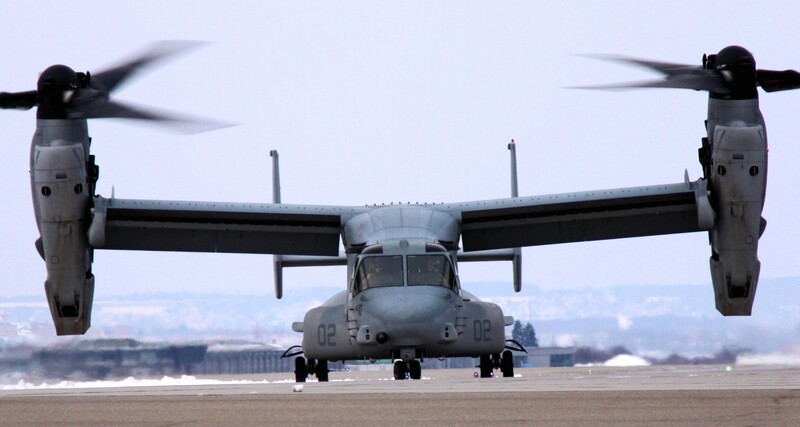 A total of 34 combat sorties and 65.3 combat hours were flown in support of Operation Allied Force/JTF Noble Anvil. 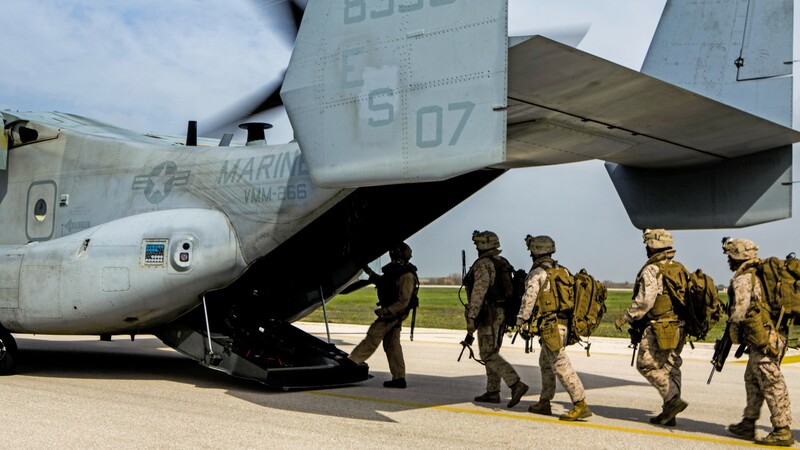 In addition to AV-8B strike missions, two CH-46Es successfully extracted a Navy Special Warfare Team Personal Security Force from Petrovic, Macedonia. In April 1999, the squadron received the FMF Atlantic Annual Aviation Safety Award as well as the CNO Aviation Safety Award for calendar year 1998. 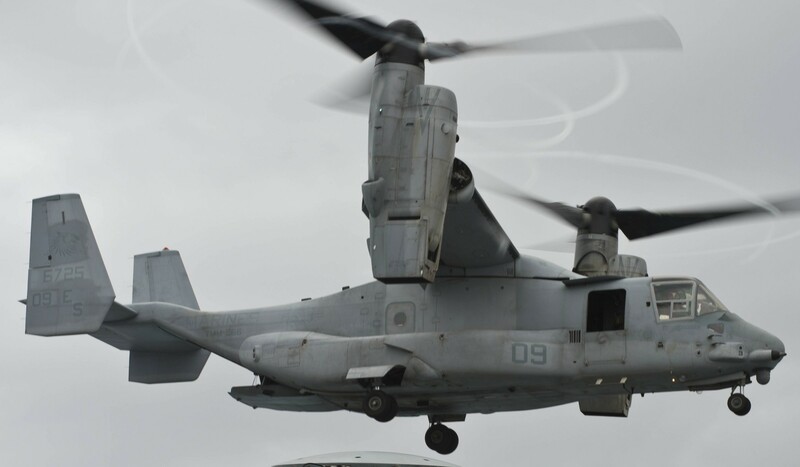 In May HMM-266 (Rein) returned to MCAS New River, and the squadron was awarded the “1999 Marine Medium Helicopter Squadron of the Year” from the Marine Corps Aviation Association. In September, the squadron took part in humanitarian assistance efforts in North Carolina after the state was ravaged by Hurricane Floyd. 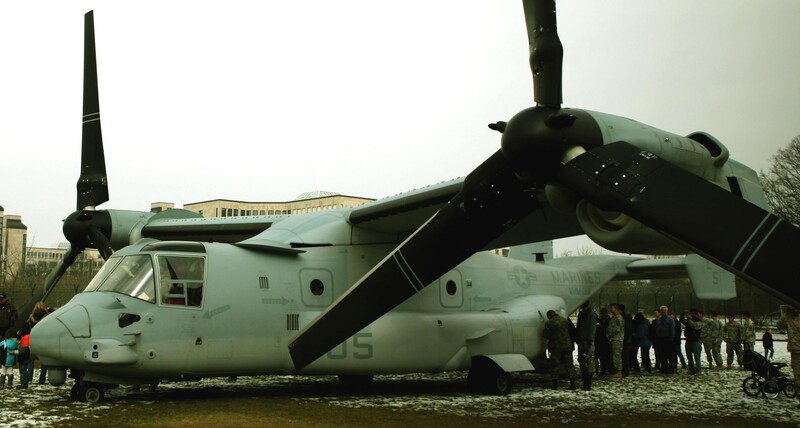 The Fighting Griffins assisted the Federal Emergency Management Agency (FEMA) in delivering food and water to locations inaccessible by vehicles. During January 2000, HMM-266 deployed to MCAGCC to support CAX 3/4-00 and WTI. 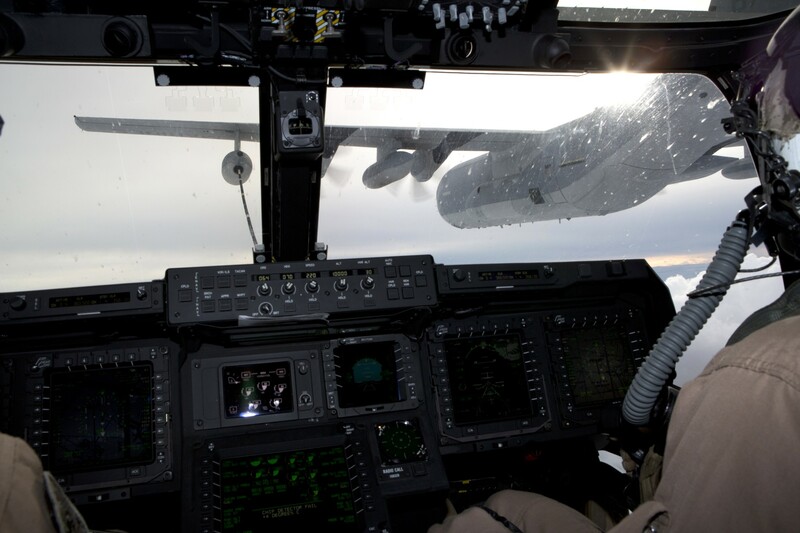 In May, the squadron deployed a detachment of three aircraft to Thessaloniki, Greece on C-5 Galaxy strategic lift assets as part of NATO Exercise Dynamic Mix. 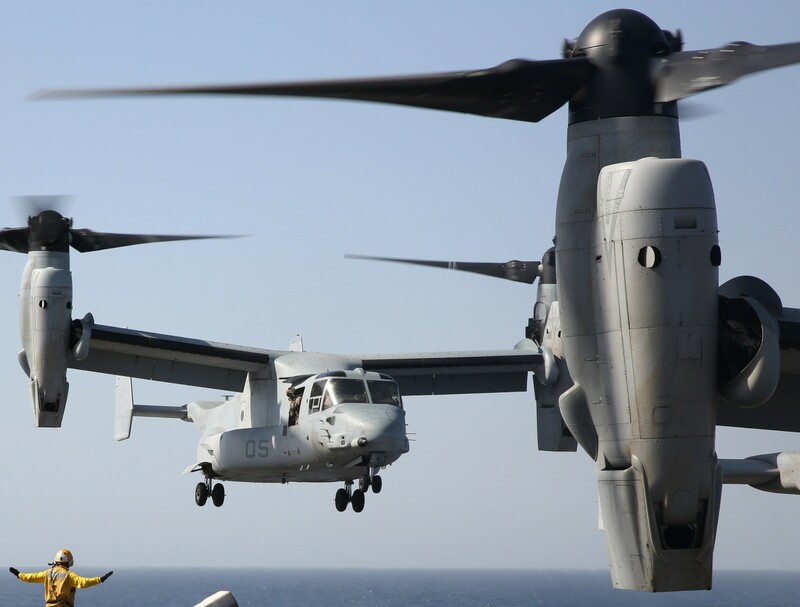 In October, the squadron formed the core of the ACE for the 24th MEU followed by the deployment on LF6F 2-01 in April of 2001. 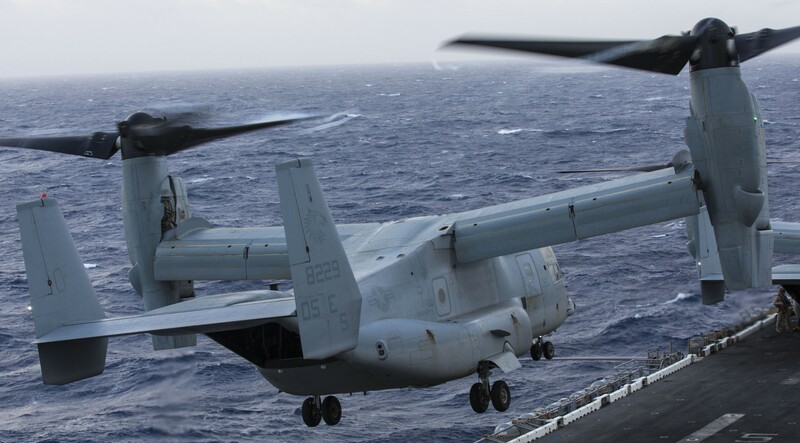 In May 2001, the squadron completed the trans-Atlantic crossing and entered the 6th Fleet area of responsibility. The Fighting Griffins participated in Exercise Med Shark with the Moroccan military and Exercise Cooperative Partner in Georgia. 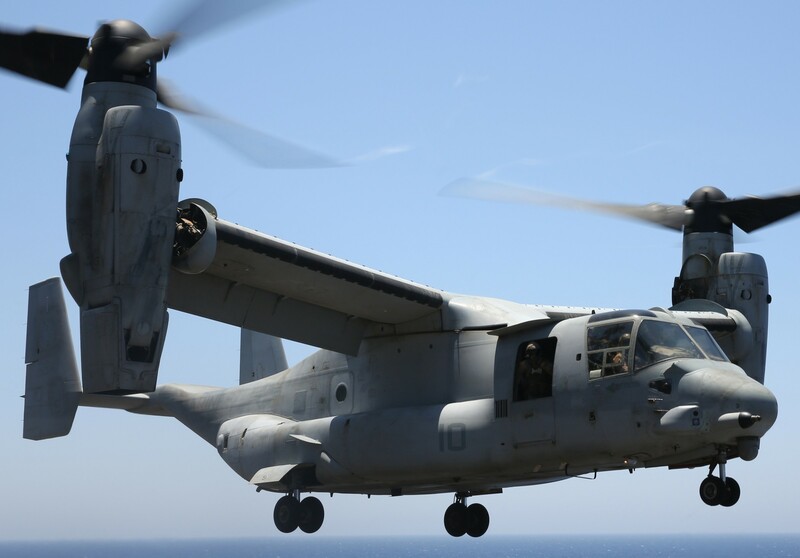 HMM-266 also took part in Operation Trident D'Or in Sardinia, which included over 15,000 personnel and 50 warships from Spain, Italy, France, and the United States. 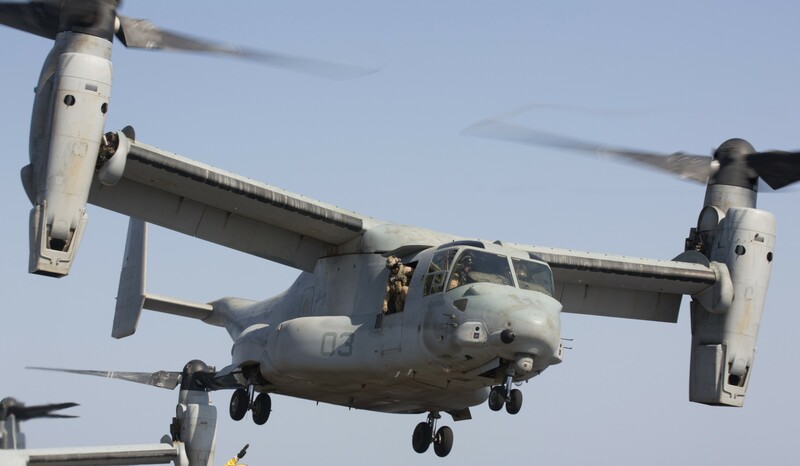 During the last six months of 2001, HMM-266 (Rein) continued operations as the ACE for the 24th MEU (Special Operations Capable). In mid-July, the squadron was positioned off the coast of Genoa, Italy in order to provide security for the President during the G-8 summit. 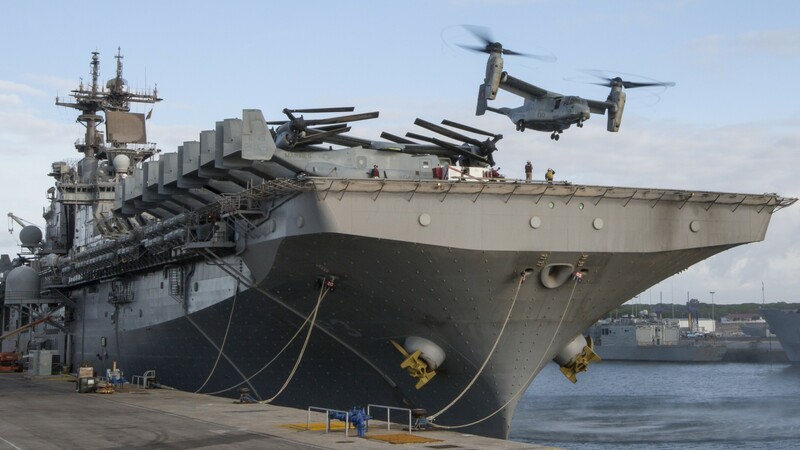 In September, a detachment of four CH-53Es, four AH-1Ws, and 121 ACE Marines left the USS Kearsarge for Camp Bondsteel in Kosovo. This KFOR detachment participated in Operation Rapid Cheetah supporting the location and interdiction of contraband operations in the American-controlled sector of Kosovo. Following the terrorist attacks of September 11, 2001, the squadron prepared for contingency missions. In January 2002, HMM-266 was the first squadron in 2d MAW to fully integrate the risk management program, Squadron Assistance/Risk Assessment (SARA), into the development of flight schedules. 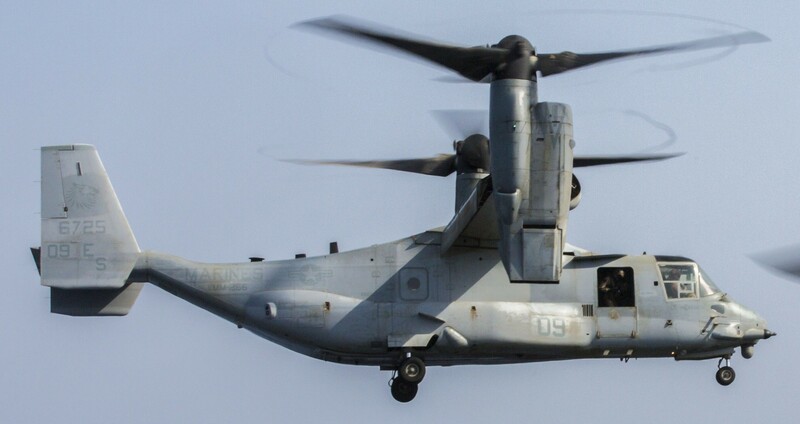 The squadron also completed the validation and verification of the Engine Condition Control System (ECCS) modification to the CH-46E, a process that had initially begun in the squadron years earlier. 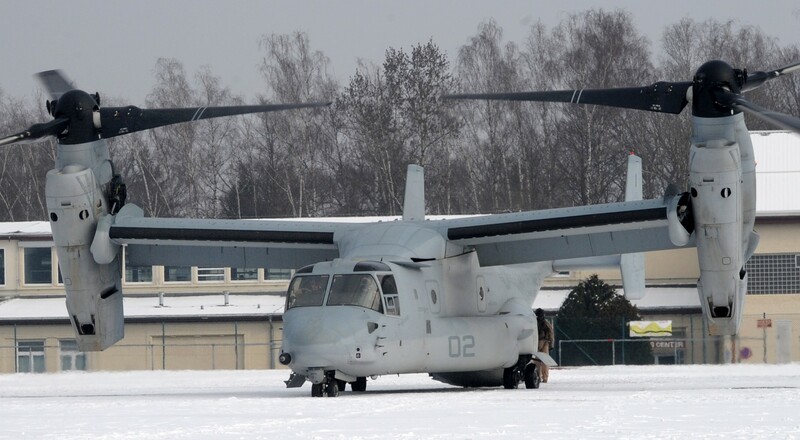 Additionally, HMM-266 was chosen to support the testing of a new M3M .50 caliber machine gun mount. 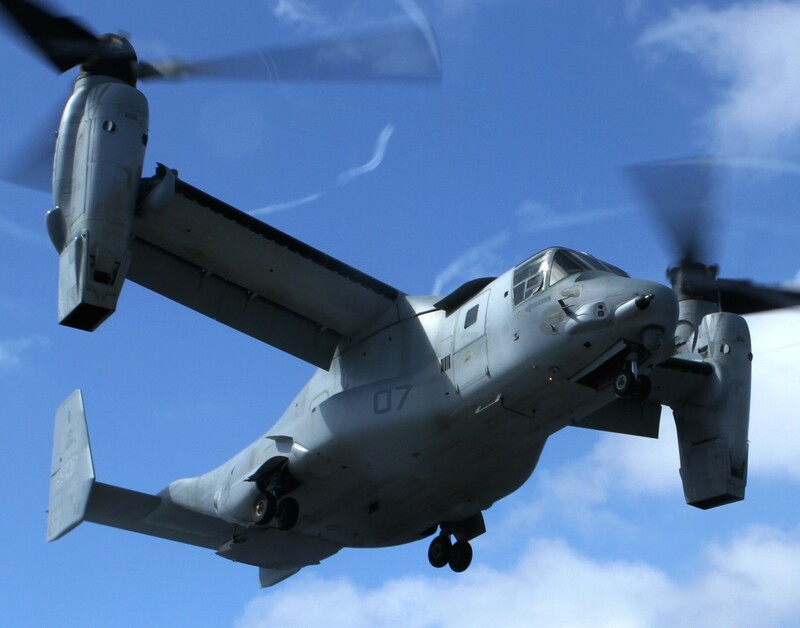 During April 2002, the squadron supported the New River Air Show, the Tri-City Air Show in Tennessee, Congressional Day in Quantico, Virginia, and a Capabilities Exercise (CAPEX) at Camp Lejeune. 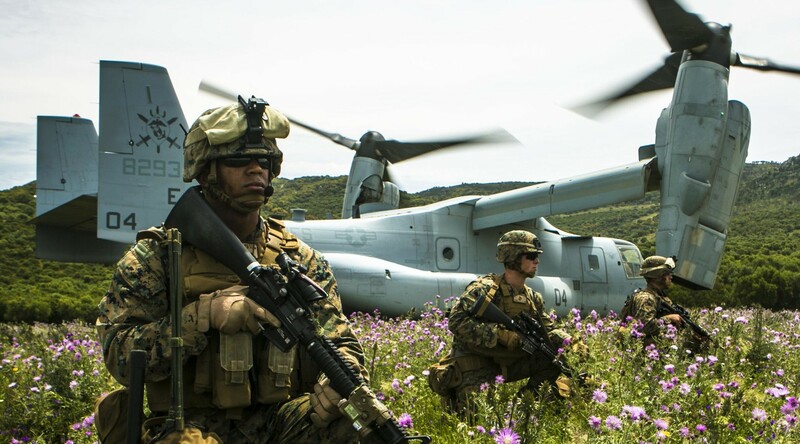 The month ended with the beginning of a new MAG-26 exercise, Diamond Thrust, designed to demonstrate the air capability of a Marine Expeditionary Brigade (MEB). 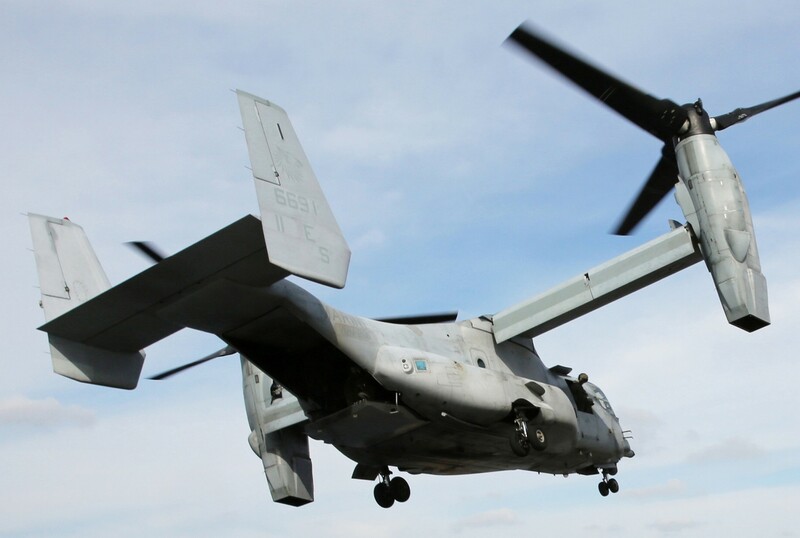 HMM-266 supported this exercise, conducting tactical troop lifts and CASEVAC missions as well as utilizing Forward Arming and Refueling Points (FARP). In September 2002, the Fighting Griffins deployed to Camp Dawson, West Virginia for a three-week training period. The squadron conducted mountain training, which provided the opportunity to perform mountain area landings and terrain flight in an environment other than Coastal North Carolina. In April 2003, HMM-266 again executed Diamond Thrust in Yuma, Arizona. 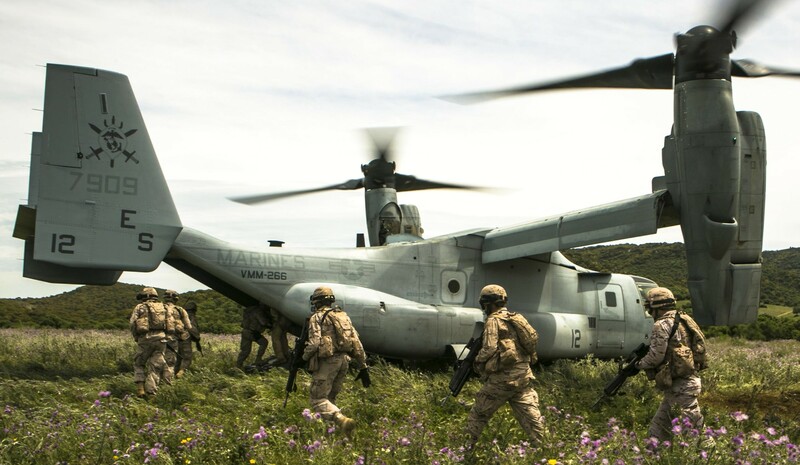 The Fighting Griffins participated in CASEVAC, movement of Marines and cargo, and various assault support missions, as well as conducting squadron training. 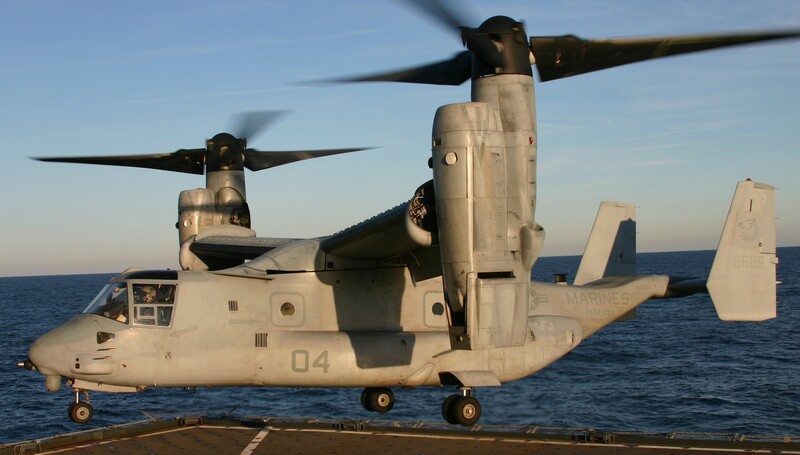 On 21 May 2003, Boeing Vertol and HMM-266 unveiled the first Engine Reliability Improvement Program (ERIP) equipped CH-46E in the Marine Corps. 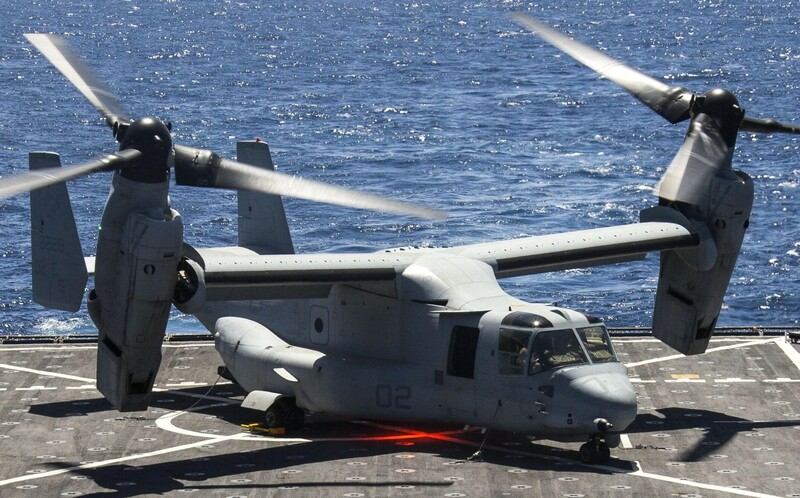 HMM-266 then had an 18 July CHOP to the 22d MEU as part of the first East Coast Expeditionary Strike Group (ESG). In December, HMM-266 became the first ACE to conduct amphibious operations at Eglin AFB, Florida as a part of the ESG/MEU work-up. In January 2004, the 22d MEU completed the special operations capable evaluation and was certified as Special Operations Capable (SOC). 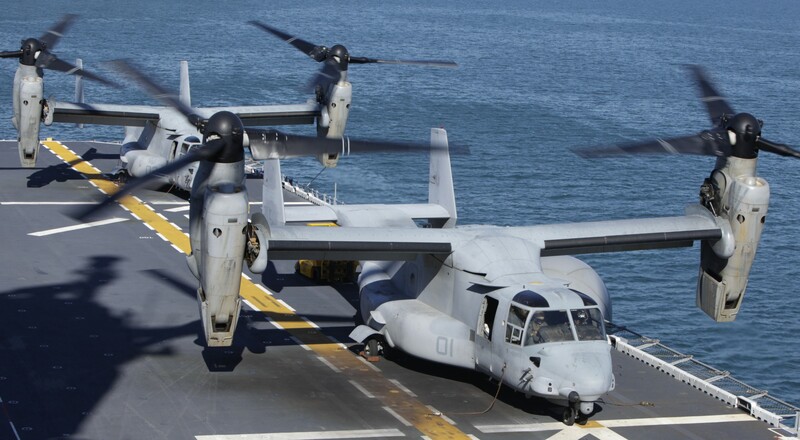 In February, the Fighting Griffins boarded the USS Wasp and sailed east for the Mediterranean Sea as part of LF6F/LF5F 1-04 (18 Feb 04 – 16 Sep 04). They passed through the Suez Canal and debarked in April to establish a base of operations in Kandahar, Afghanistan to participate in Operation Mountain Storm. Operation Mountain Storm was extended one month, and HMM-266 ceased combat operations on 10 July, returning home on 16 September. In November 2004, HMM-266 sent a detachment to MCAGCC for CASEVAC in support of Revised CAXs (RCAX) 5 and 6. On 22 November, operational and administrative control of the squadron transferred from MAG-26 to MAG-29 as MAG-26 prepared to deploy in support of Operation Iraqi Freedom (OIF). During February 2005, the squadron conducted a deployment for training to Savannah, Georgia. 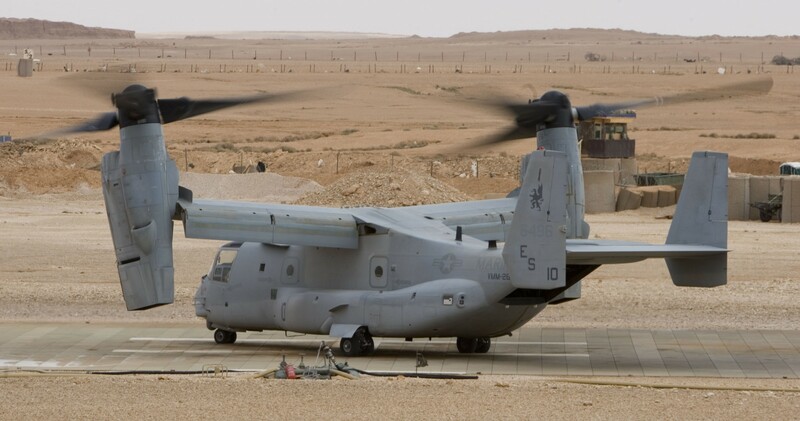 In June of 2005, the Fighting Griffins deployed 8 CH-46E to Yuma, Arizona to participate in Exercise Desert Talon 2-05 and to support RCAXs 29 and 30. 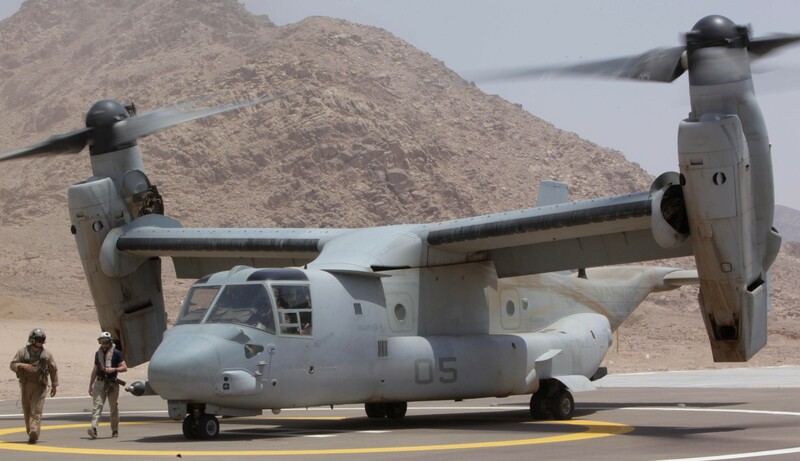 By July 2005, HMM-266 was ready to deploy its Advanced Echelon (ADVON) to Iraq in support of OIF 04-06.2. 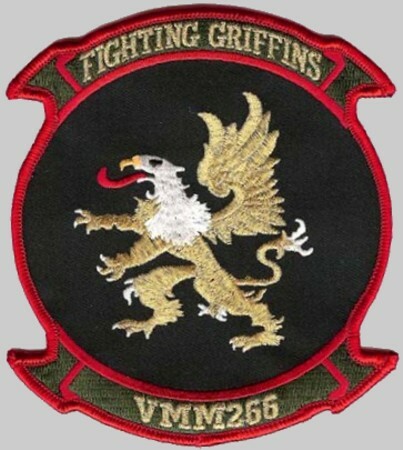 On 7 August 2005, the Fighting Griffins deployed to Al Asad, Iraq to support OIF. 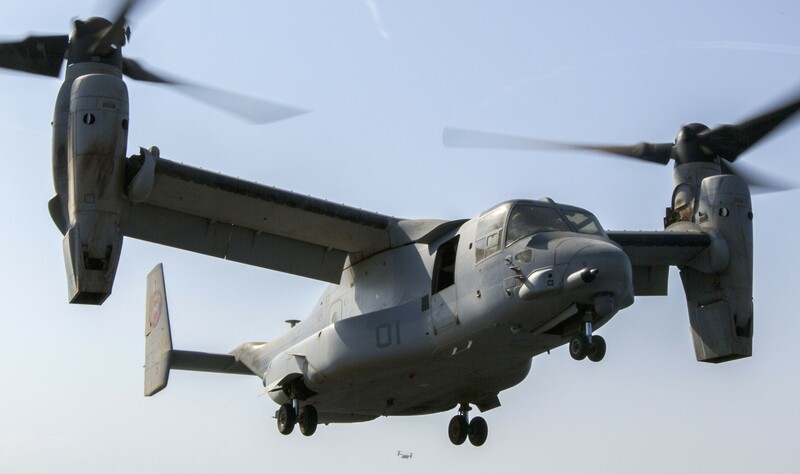 The Fighting Griffins assumed the mission of medium lift assault support from HMM-264 at 0700 on 20 August 2005 and are currently conducting Direct Combat Support Missions in General Support of II MEF (Fwd) from Al Asad Air Base. The Fighting Griffins successfully returned from Iraq on 7 March 2006. 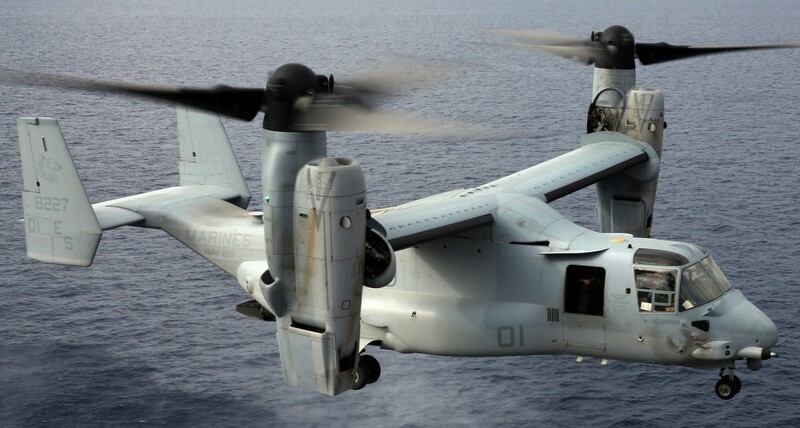 Shortly thereafter on 15 June 2006, the squadron stood down in order to later become the third operational MV-22 squadron. 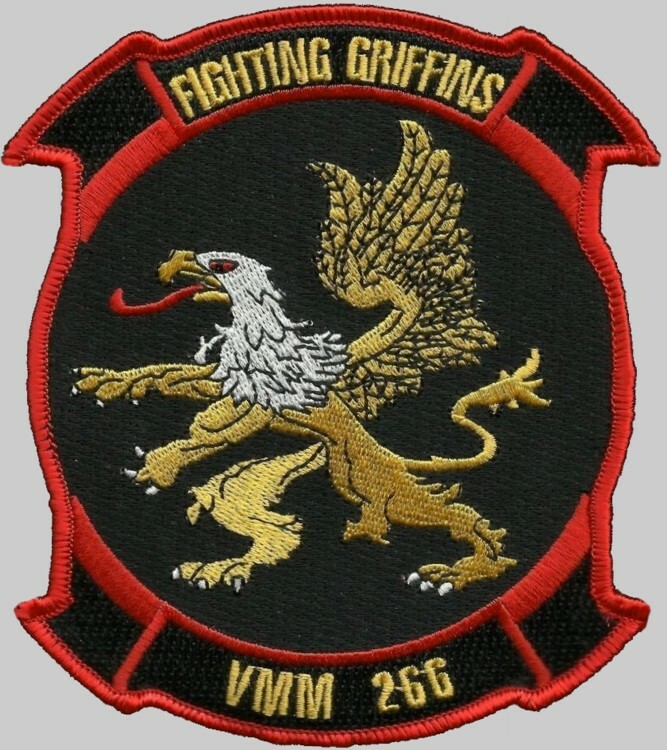 On 23 March 2007 the Fighting Griffins officially stood up as VMM-266. 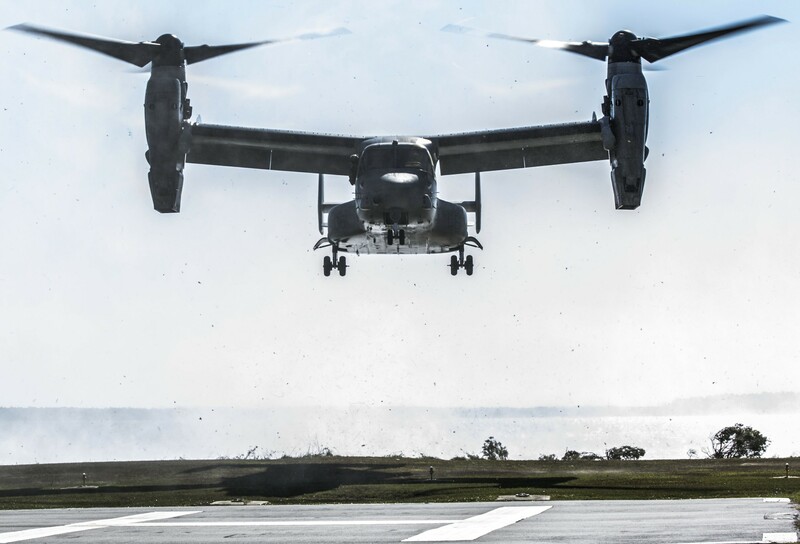 As with all transitioning squadrons, standing up a VMM requires the squadron to become core-competent or qualified in the air, on the ground and in the maintenance hangar. Achieving this core competency is referred to as Milestone 33. 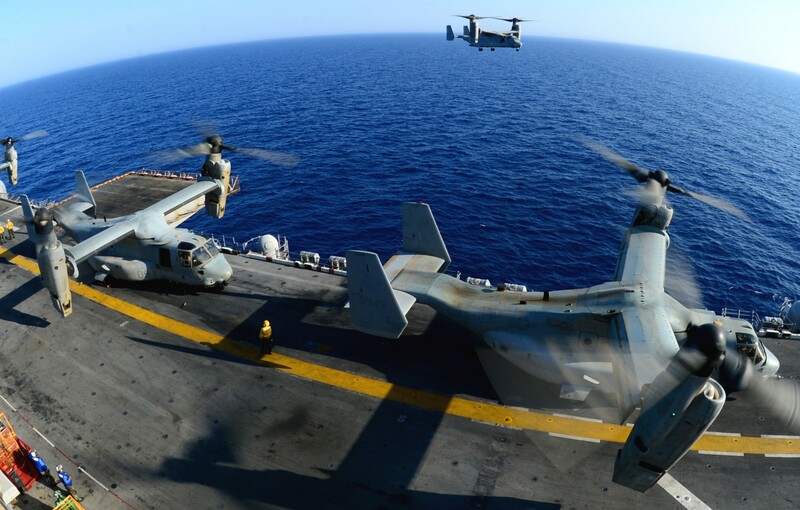 Immediately after reaching Milestone 33, the squadron began to plan and train towards becoming a composite squadron and assuming the Marine Expeditionary Unit (MEU) Mission. 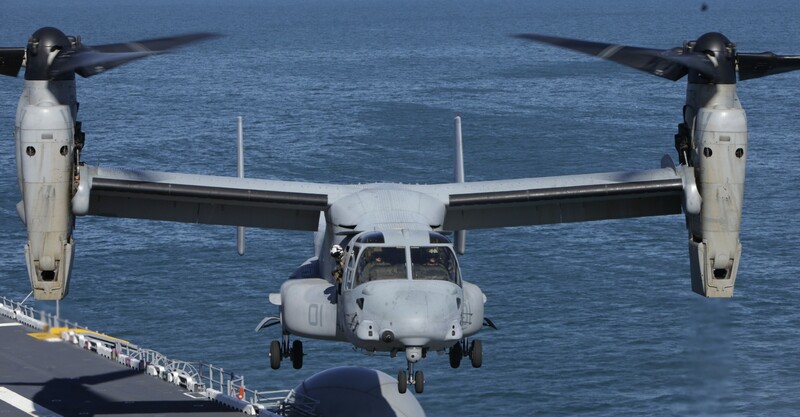 This challenge for VMM-266 would entail integrated training with other type/model/series aircraft as well as specific mission profiles with the Ground Combat Element (GCE) assigned to the MEU for shipboard operations. 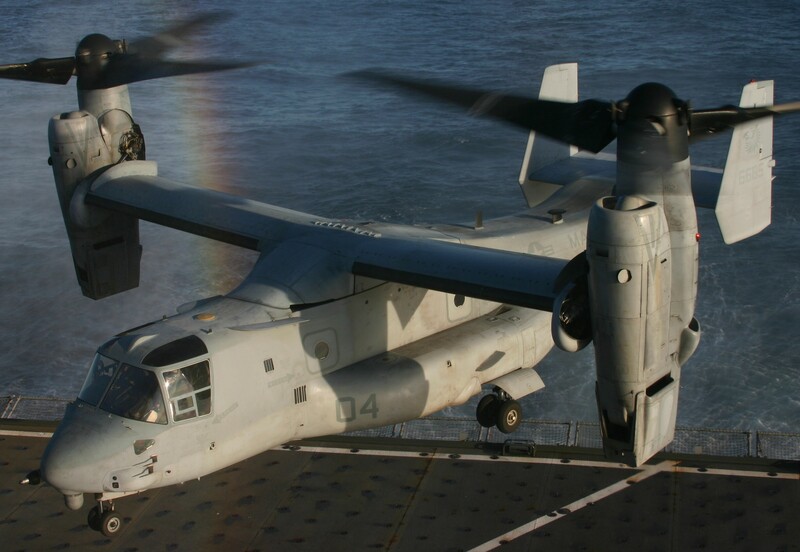 VMM-266 continued to execute training for this mission until February 2008 when the squadron received orders to change its focus and to prepare for a combat deployment in support of OIF. In just six months the squadron shifted the focus of its training; to familiarizing itself with the type of profiles the aircrew would be flying in Iraq. 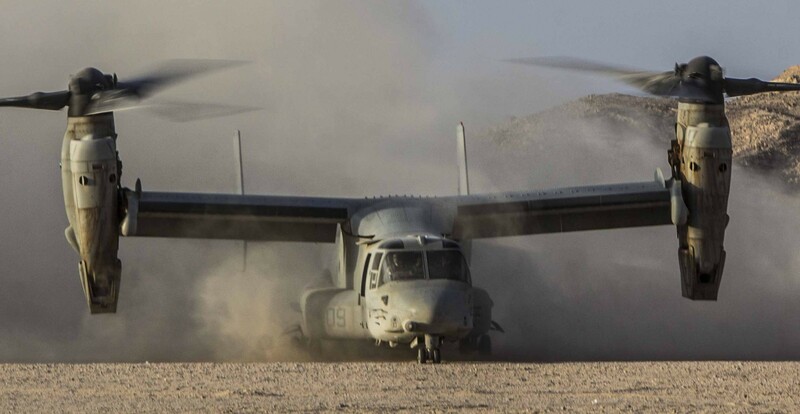 Once again, the Fighting Griffins of VMM-266 rose to the challenge quickly learning lessons from the previous VMM squadrons and to become proficient in the continuous demands of the desert environment. 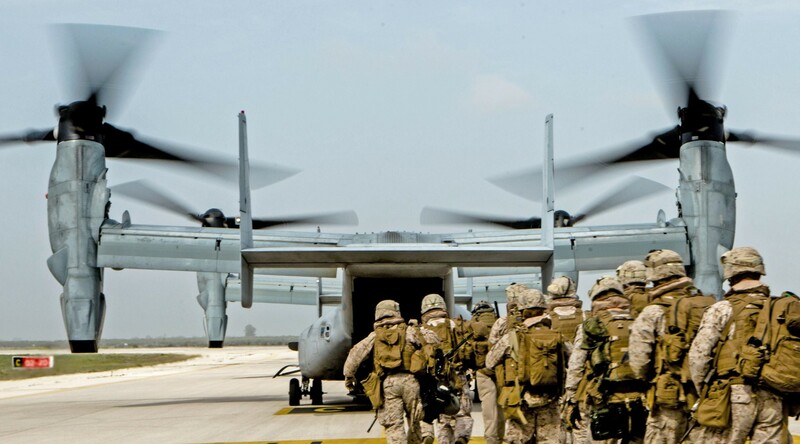 In June 2008 VMM-266 proved its determination after completing a training and certification exercise intended to test the readiness of air units to accomplish the OIF mission known as “Desert Talon.” The successful completion of this exercise demonstrated the flexibility, attention to detail and initiative of the Fighting Griffins of VMM-266. The command led the squadron with the same expectation for excellence once the squadron had established its presence aboard Al Asad Airfield, Iraq. 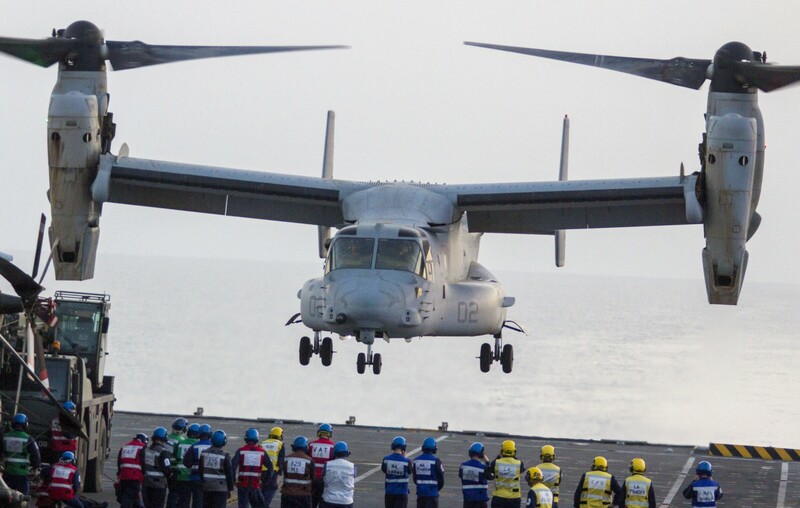 The integration of training with operational tasks enabled VMM-266 to continue to expand its potential and strength to the fighting force, another of the many positive outcomes of aggressive and confident leadership and guidance coupled with the tenacity and initiative of all Fighting Griffins. 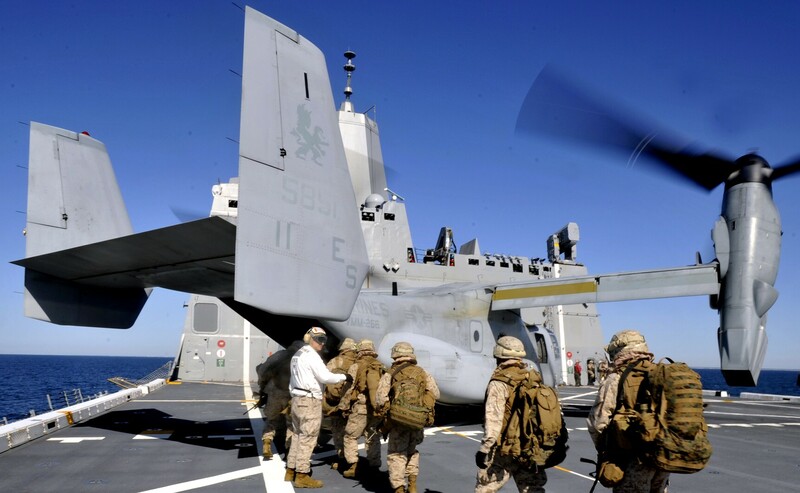 The success that VMM-266 enjoyed during OIF was a testament to the hard work, dedication and adaptability of the Marines, Sailors, and civilian contractors who made it possible. 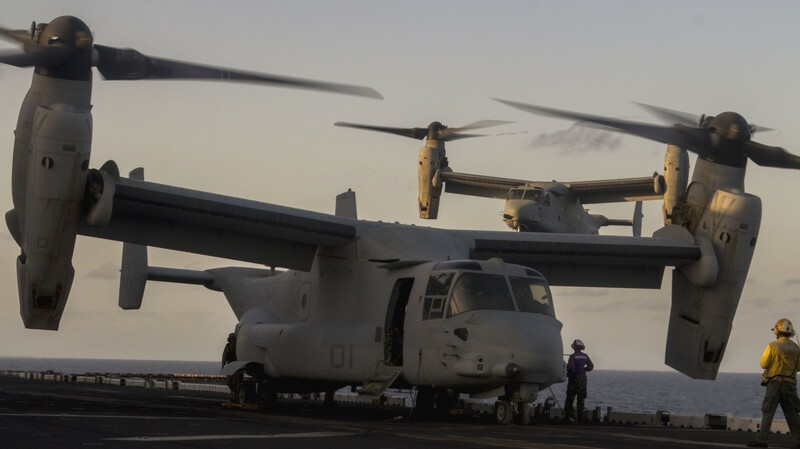 To accomplish the long awaited return to the states, the Fighting Griffins finally planned and coordinated the squadron’s redeployment along with its 12 MV-22B Ospreys back to MCAS New River, NC aboard the USS Wasp. The vessel would be boarded off the coast of NSA Souda Bay, Crete, Greece following a brief stop aboard Incirlik AFB, Turkey. 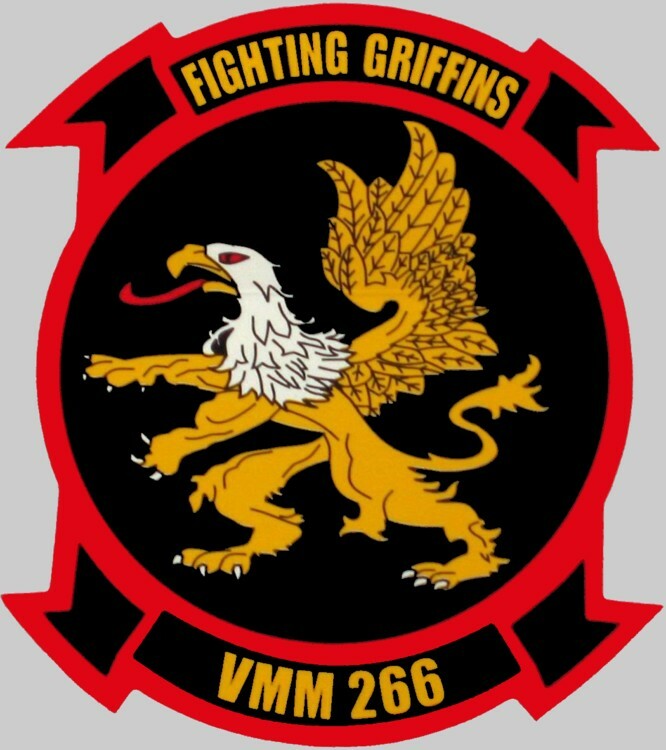 It was another challenging and demanding chapter for the operational mission of VMM-266, but the Fighting Griffins proved to be up to the challenge. 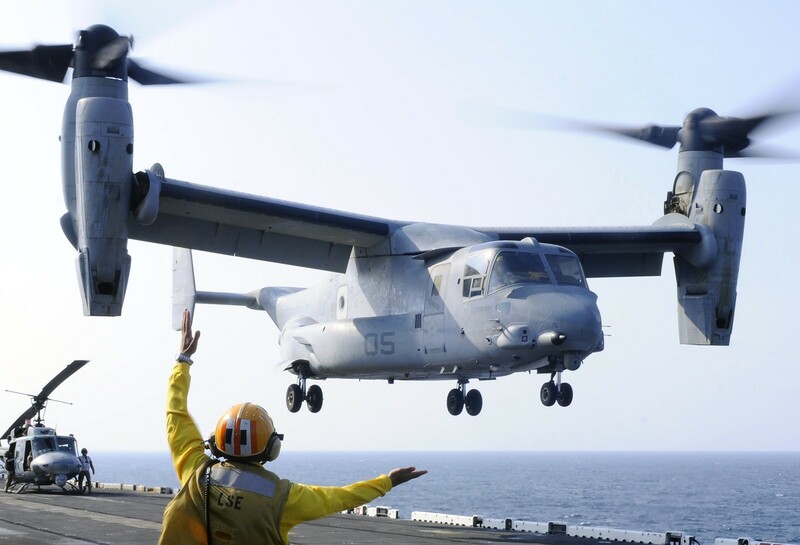 May 15, 2009 marked another first for the Osprey community and VMM-266 as the squadron conducted a fly-in to MCAS New River from the USS Wasp anchored off the east coast of NC. The entire squadron and its 12 aircraft, which had performed remarkably well for three consecutive deployments in support of troops from all services throughout Iraq, returned home. 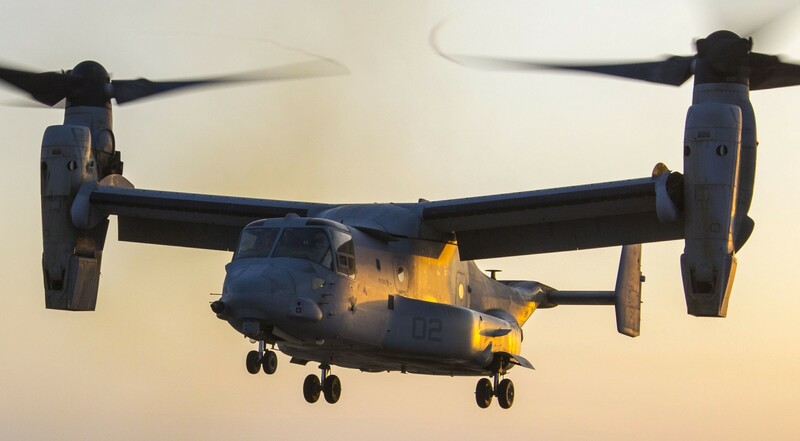 This was not only testament to the successes of VMM-266 in Iraq, but also honored those accomplishments of VMM-162 and VMM-263 who paved the way for the MV-22B in Iraq with these very same aircraft.